it turns out that if you view it from the side as you come around it, instead of straight on . . .
it’s a woman’s profile. 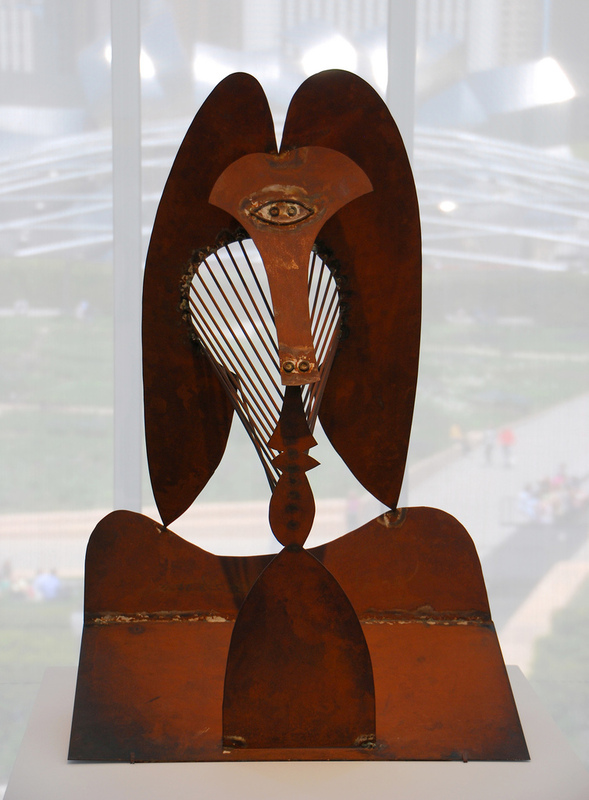 In fact, at just the right angle, you really see the woman and her cheekbone lines from the front– especially if you look at the sculptor’s model in the Art Institute of Chicago. The hair, the shoulders, the cheekbones, it’s all there. Although that model could still be an especially fetching baboon. Hard to say. 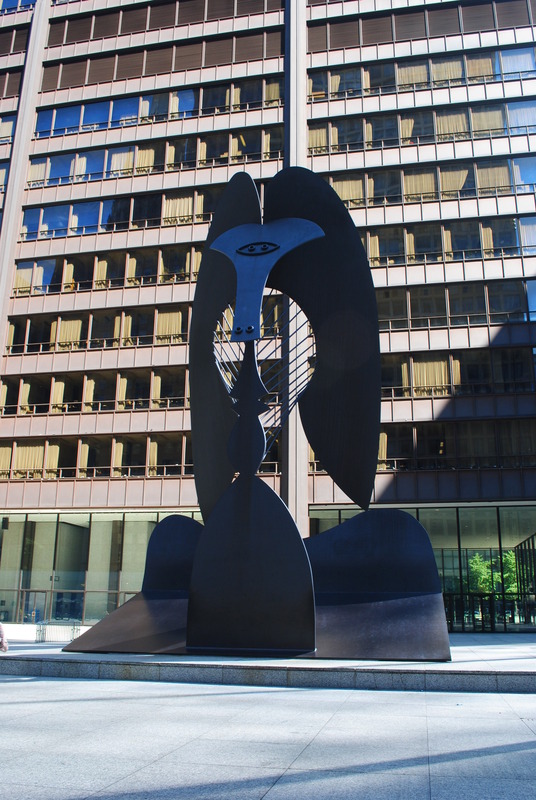 Picasso designed this mammoth statue for the city of Chicago– it’s 50 feet tall and weighs 163 tons. At that size, whether or not you understand it, you will find yourself looking at it. But wait– there’s more. Because it’s a huge piece of art in a huge public space, you will find yourself as part of a community that interacts with it. People navigate by it, eat lunch by it, stage movie scenes around it (remember the Blues Brothers? ), and allow their children to play on it. Can you do that? Play on a Picasso? 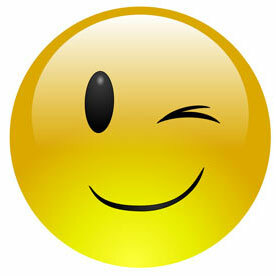 Is that cool? 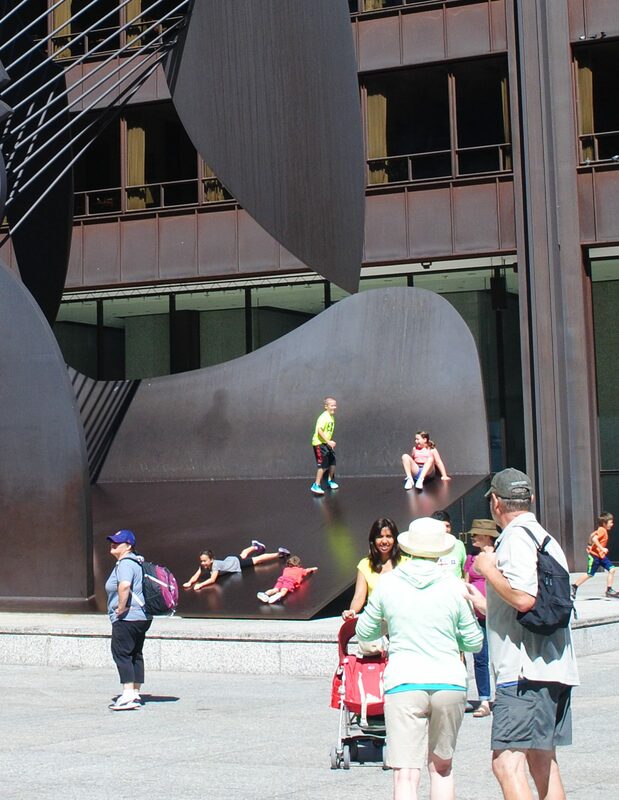 Some onlookers clearly think not, but others seem to believe this was Picasso’s intent all along– let the children run and slide on it! Me? In my head, it will always be a horse, but Picasso loved bending the lines of life. I think he’d be thrilled that we are perplexed. “Keep your eyes squinting at it, your mind chewing over it, your children running up and down on it,” this is what I think he’d say. 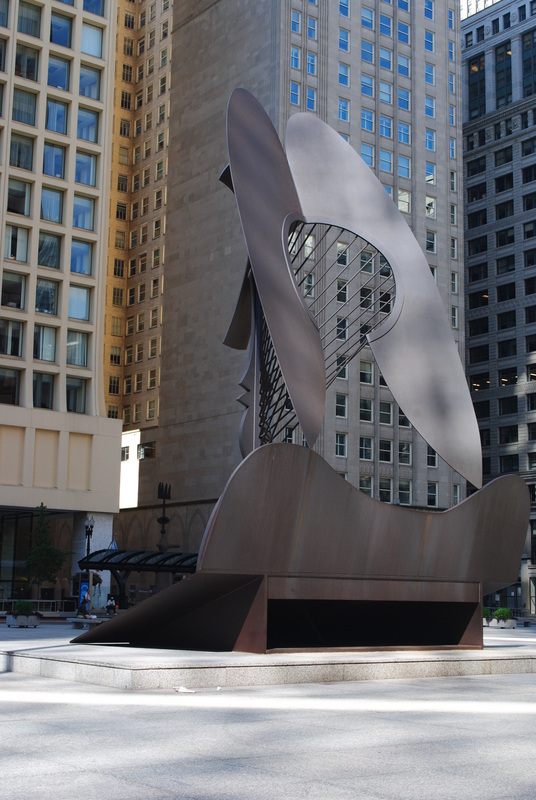 So Chicago has its untitled Picasso, a gift given freely by the generous artist– a little nonsense standing at the navel of a great city, daring its inhabitants to guess its riddle. 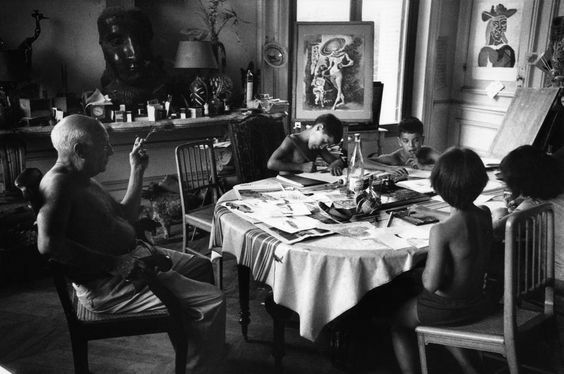 Pablo Picasso knew exactly what he was doing. . .because even if we don’t get it, we still get it. < Previous Chicago: Bean There . . . I think it looks like an afghan hound furiend of mine. She would welcome visitors sharing lunch, children playing on her & camera’s taking her picture. Actually, I think I read that Picasso loved dogs and had lots of them, so maybe it IS an Afghan Hound. We’ll never know. There is a Picasso painting at the Norton Simon museum in Pasadena that I could have sworn was a horse and yet is titled “Head of a Woman”. It pretty much sealed my opinion that Picasso didn’t really think very highly of women. Or perhaps he thought very highly of horses?